I love pickles. so. much. In middle school, there was this deli by the field where we would have lacrosse practice. The team would always stop by and buy large dill pickles to gnaw on before practice (weird, I know). My love of pickles continued throughout college and graduate school. During trips home, I would load up hamburgers with homemade quick pickles at our favorite burger spot. While I was at school, I would snack on peperoncino peppers while I cooked dinner at night. When I make homemade pickles this past summer from Smitten Kitchen‘s awesome recipe, I knew that I had hit the mother load of knowledge. I now knew how to pickle pickles. Which meant that I could pickle other things too, right? So, I pickled onions because they are my newest obsession. 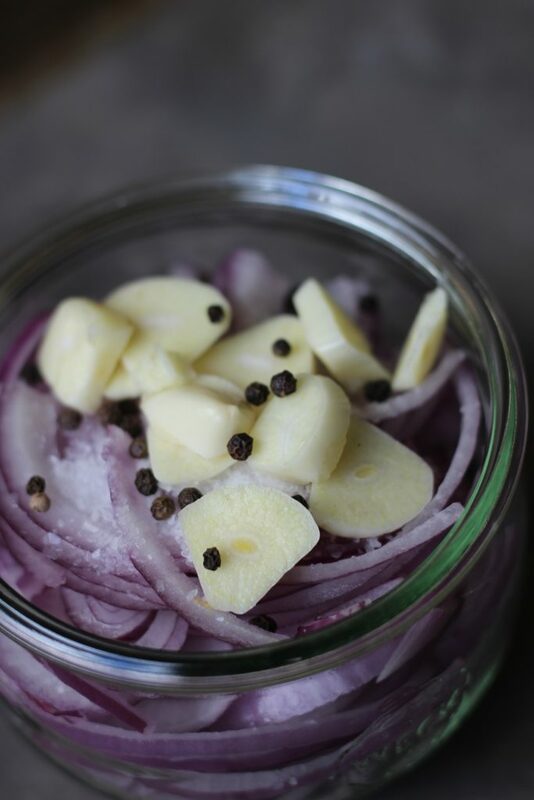 Pickled Onions may seem like a slightly interesting pickled vegetable, but they can be used in a hundred different ways (and you know how much I love multiple-duty recipes). They can be an awesome addition to your weekend bagel with cream cheese + smoked salmon. They are delicious in salads. You can chop them up and add them to egg or tuna salad for a vinegar-y kick. But I love them best on tacos. 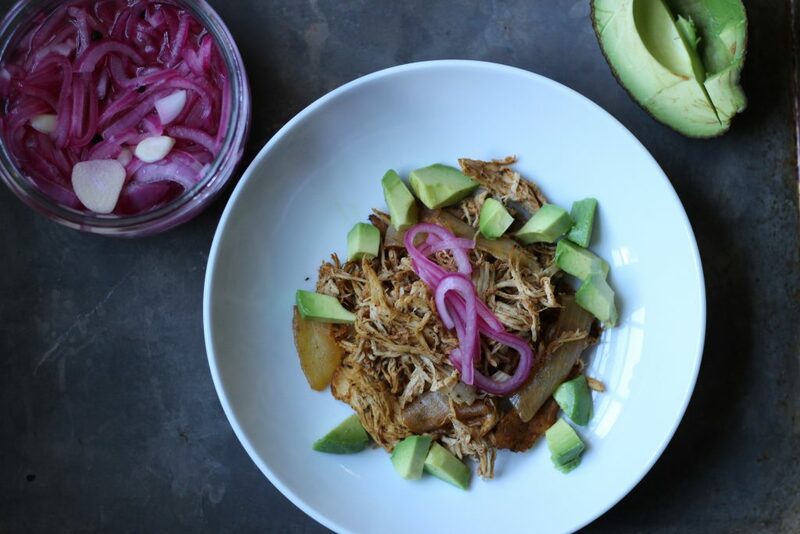 Shredded beef + pickled onions + pico de gallo. Taco Tuesday at its finest. Oh, and did I mention that pickled onions are probably the easiest thing to make ever? You need to find a jar with a tight-fitting lid. 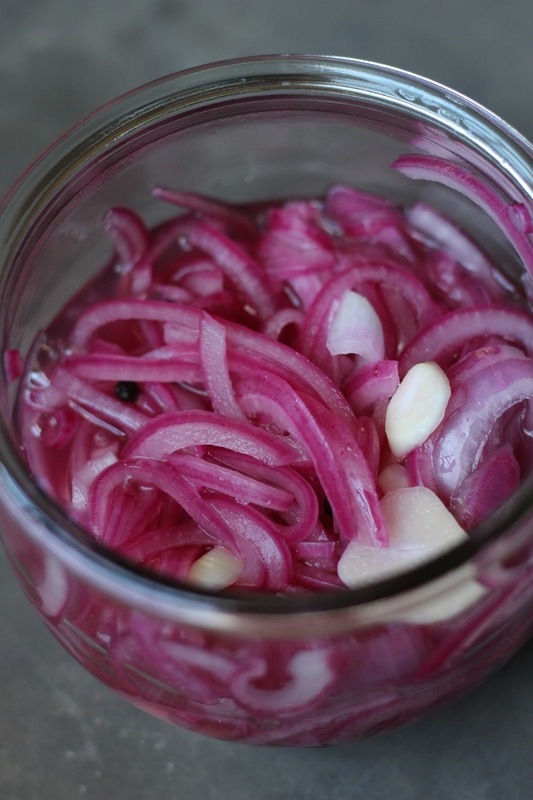 And fill it with thinly sliced red onion – I cut my onion in half and made thin half-moons. Don’t be afraid to really pack the onion in there! Add in some kosher salt. And then add in some fresh sliced garlic and some black pepper corns. Finally, add in some white vinegar. Then slap on the lid, shake, and pop the jar into the fridge for a minimum of four hours before enjoying! 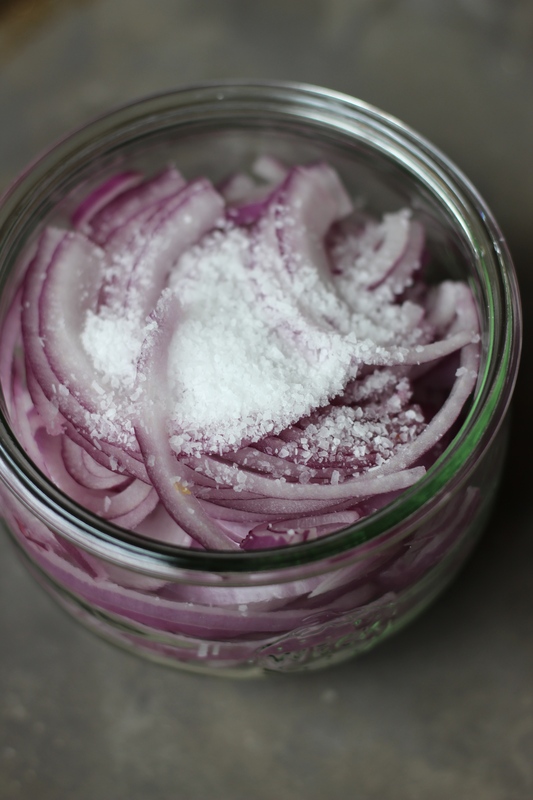 The vinegar makes the onions soft and sweet (and turns them the best fuchsia color!). I add them to everything, but they tasted DIVINE on top of homemade chicken carnitas (recipe coming next week!). So, what’s your food obsession? Simply A (RD) Fact: Onions are great source of potassium and vitamin C! In a jar with a tight-fitting lid, combine all ingredients. Place lid on the jar and shake to combine. Refrigerate for at least four hours, shaking the jar at least once an hour. Serve immediately or keep refrigerated for up to one week.